There’s a controversy playing out among the feminist community around the candidacy of Hillary Clinton. Would a Hillary presidency represent an advance for women — or have her record and past policies done more harm than good, especially for poor and middle class women? Some feminists are saying the chance to elect the nation’s first woman president is too good to pass up. But others are hoping for a woman candidate in a future election who more closely represents their views on social and economic justice for all women. 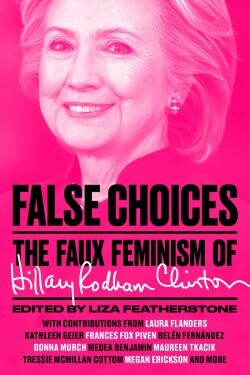 Liza Featherstone is the editor of a forthcoming book of essays written by the second kind of feminist, False Choices: The Faux Feminism of Hillary Rodham Clinton. It brings together scholar and activists who examine Hillary Clinton’s candidacy for president from a feminist perspective. The essays, which take up such issues as welfare reform, mass incarceration and the war on drugs, military intervention and economic policies that favor big banks and corporations, argue that voting for Hillary Clinton is a “false choice” for feminists. And they question whether the Democratic Party’s record on protecting reproductive rights is actually good enough to ignore Clinton’s other policies and vote for her. Contributors include (among others) Laura Flanders, Medea Benjamin, Frances Fox Piven and Donna Murch. Liza Featherstone teaches journalism at NYU and at Columbia’s School of International Public Affairs. Her work appears in the Nation and Slate, among other venues. She is the co-author of Students Against Sweatshops and the author of Selling Women Short: The Landmark Battle for Workers’ Rights at Wal-Mart. False Choices will be published in June by Verso Press. Her article, “Why This Socialist Feminist Is Not Voting For Hillary” appeared in the Nation. Rutgers University historian Donna Murch is a contributor to False Choices: The Faux Feminism of Hillary Rodham Clinton. Her essay, “The Clintons’ War on Drugs: When Black Lives Didn’t Matter” explores the origins of Democratic Party’s turn to the right, exemplified by the Clintons both in Arkansas and in the White House and the policy of mass incarceration they promoted. Donna Murch spoke with Francesca in a wide-ranging hour-long interview that covered not only mass incarceration and its impact on communities of color, but also why older black voters are supporting Hillary Clinton in large numbers — and why younger black voters are going overwhelmingly for Senator Bernie Sanders. An excerpt from that interview airs on this episode, but you can hear the extended interview here. Donna Murch teaches at Rutgers University. Her work centers on issues of mass incarceration and the history of black social movements.